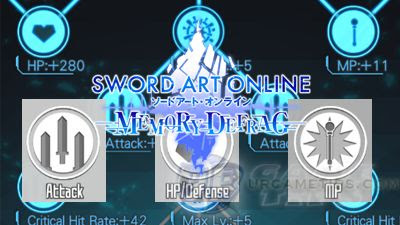 Here's a guide on how to Limit Break or Limit Hack your characters in the action RPG mobile game - Sword Art Online: Memory Defrag. Limit Breaking characters will increase their Lvl caps, and will also receive bonus stats depending on which path you choose. - In the Attribute Matrix, Hacking Crystals can be used to perform Limit Breaks. Doing so will raise the upper limit of a character's level, allowing for more ability enhancements. - After performing a Limit Break, you can choose to increase Attack, HP/Defense, or MP. - Note: You can change the stat whenever you like, but you need to obtain the requirements again. - It is highly recommended that you only do this to your core 6* or 5* characters, to increase their Max Lvl to up to Lvl 100. - Required items for Limit Breaking your characters. 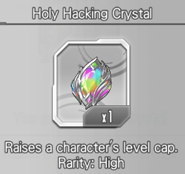 - When scouting characters, if one you already own appears, you can receive Hacking Crystals instead. 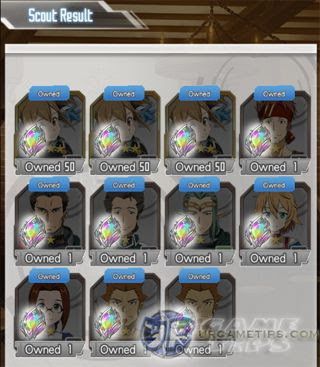 The number of crystals received depends on the rarity of the character. *Note: In order to Limit Break 6* units, you'll need Hacking Crystals, Elemental-matched Sacred Hacking Crystals, and Almighty Sacred Hacking Crystals. - Sacred Hacking Crystals can be obtained from events, quests rewards, or by exchanging them from the Shop. - One tip is to spend your Diamonds on Scout Banners that features only around 3 characters. - Check the "Characters and Rates" option to double check, if there are only around three 6* or 5* characters on the list, then that's the banner that you should try pulling. - Some banners will also give higher chance to some selected 5*/6* characters. This is also good if you already have the featured characters. - Note that Scouting requires a lot of Diamonds and Luck, because the percentage chance of getting a 5*/6* character is only 4%. - Only pull once or twice a day, but avoid pulling twice or more in a row though because it would almost give similar results. - I don't know but personally, it looks like I have better luck when pulling right after the daily server reset LOL~ check example pic above. - Single Pulls however is also a good choice if you are running low, or if you want to conserve MDs. Limit Breaking Event Based Characters! - Free characters from events like Kirito [Fairy Dance] and Asuna [Captive Princess] can be limit broken by using some farmable hacking shards, crystals or items from limited events. - Note: Only the game devs knows when these limited events will return, but highly recommended that you max limit break them before the event ends. Limit Breaking "Ranking Event" Characters! - Characters that you get from the Medal Scouts can only be limit broken by using a special kind of Hacking Crystal, exclusive only to them. - Similar to the regular Scout, these type of Hacking Crystals can only be obtained by scouting duplicate characters using certain kinds of Medals under Medal Scouts (available only during Ranking Events). - Sword Dance Hacking Crystal = For Sword Dance series and characters for example. - Idol Hacking Crystals (Limited Event) = Similar to Medals, but this time you'll be needing "Idol Like" VIP Tickets to draw characters and farm Idol Hacking Crystals. - Note that Limit Breaking these characters will also get higher stats increase than regular Scout units. - Note that these items can be obtained from ranking events and mission completion rewards. Which Character to Limit Break? - Actually depends on your personal preference, but if you want some advice, I would recommended checking our Tier List to check which characters we recommended to limit break right away. - Prioritize your Core DPS unit first. - In case you have multiple characters under rank SS or SS+ for example, go first with the one that has the best weapon and/or with high hits/sec. If you have limited resources, it is also recommended that you Limit Break Dagger, Lancer, Rapier, Dual Blades or Sword wielder units that are under the Neutral, Dark, or Holy element (won't get damage reduction vs any element). - These are pretty good units that can also be used for most Boss battles, if you have a strong unit that can debuff, then that is also a good candidate for Limit Breaking. Which Stat or Path to Choose? - Stats below are based from FREE units, Gacha characters will get higher stats (around +35% or higher depending on the character). Medal Scout characters from ranking events will also get even higher stats than Gacha characters. - Total stats generated are random but still under the same range. - You will never go wrong here, unless you have a full support unit who doesn't attack much like Asuna [Captive Princess]. - Highly recommended for DPS Core units (usually Dagger, Lancer, Rapier, Dual Blades, and Sword wielders). - Not really recommended, because for a game that requires heavy dodging/parrying and fast stage completion, you'll eventually find these added stats kinda lacking...honestly. - Even for characters that are squishy, these stats won't be enough to save them, better upgrade your gears and learn to dodge well at least. - Might be good for Tank characters with average or low DPS rank, especially now that we can also use them for the Floor Clearing Events. The problem is, I doubt if players would like to LB them though~ XD. - Gacha Characters: MP +9 for the 1st, 2nd, and 3rd, Limit Break; MP +10 for the 4th Limit Break. Note that the MP+ bonus above might not be exactly the same for all characters. - This is a good path but very situational, if you are looking here to increase your MP gain, then I won't really recommend, get the MP you need from armors and accessories instead. - Recommended for Casters, Ranged units, or for select Melee units with notable utility skills like Stuns (based on number of SS3s): Get this only if you want to increase your MP pool to fire more SS3s, but before that, better max your character to Lvl 80 and equip some decent gears first (consider all Gears/Battle Skills MP+% and MP requirement -% too). - Example #1: Check your actual MP during battle, then calculate if you only need some few MP points to push your MP pool and cast 2 or 3 SS3s. If your character can't reach it, it might be best to choose the Attack path instead. For best results, your character should have a Battle Skill with high MP+%. - Example #2: If you want your character to cast his or her 2nd or 3rd SS3 asap and save time, then this is also a good choice. Even better if your character has a Battle Skill with high MP+%. - Example #2 is highly recommended for full support units that doesn't attack much like Asuna [Captive Princess].